Believe it or not, it has been seven years since Tesla first launched the original ‘Model S’ – its first mass-market all-electric car. Since then, advancement in battery technology has come a long way and, with it, a refreshed ‘Model S’ in 2017. The Tesla ‘Model S’ is an executive car, which is very luxurious, stylish and is very, very powerful. Everything about it is designed to indulge, from the sports car performance to the sleek looks and awe-inspiring onboard technology. This four-door, five-seat saloon (with a hatchback tailgate) is the car that established Elon Musk’s California-based company as a force to be reckoned with – a company whose products deserve to stand alongside the likes of BMW, Mercedes-Benz and Audi. The Tesla ‘Model S’ 100D can sprint from 0-100 km/h in 4.3 seconds, on its way to a limited top speed of 250 km/h. Superior handling is the result of an extremely low centre of gravity, with the battery pack along the floor pan, centred between the axles. Thanks to this design, the ‘Model S’ is one of the safest production vehicles in the world with a 5-star Euro NCAP rating and the lowest probability of roll over of any car on the market. Without an internal combustion engine, the ‘Model S’ allows for 30 cubic foot of cargo space and offers a spacious cabin fitting five adults. The ‘Model S’ is extremely energy-efficient for its size, with a low drag coefficient at .24Cd, as well as superior battery technology. The ‘Model S’ experience starts as you approach the car, as the elegantly designed chrome door handles come out to meet you. The car senses which key you hold, meaning your seat, mirrors and steering wheel positions can be in the perfect position when you enter the car – even if you share it with others. The ‘Model S’ intelligently senses the key fob in the car and seamlessly starts the vehicle when the brake pedal is pushed. For everyday travel, simply plug the ‘Model S’ in at night at home, and wake up to a full charge. For longer journeys, the range of the ‘Model S’ and the Supercharger network combine to make long distance travel easy for drivers. Superchargers are connectors that charge your Tesla vehicle in minutes instead of hours. Stations are strategically placed to minimise stops during long distance travel and are conveniently located near restaurants, shopping centres, and WiFi hot spots. Each station contains multiple 120kW DC Superchargers to help you get back on the road quickly. In addition to this, the Tesla Destination Charger Network has convenient charging at selected hotels, restaurants and shopping centres. Tesla partners with hotels, restaurants, shopping centres and resorts to make charging when you arrive at your destination as simple as charging at home. 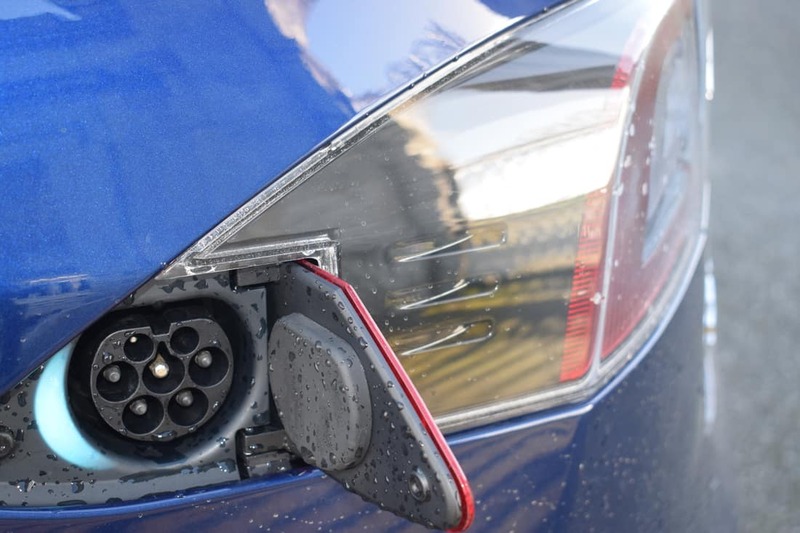 Pull up and plug into a Tesla wall connector to charge the ‘Model S’ while you shop, dine, or even during an overnight stay. There are currently over 1,000 public charge points throughout Ireland, with the vast majority being AC 3-phase (22kW), and ~ 70 Chademo DC Fast Chargers. 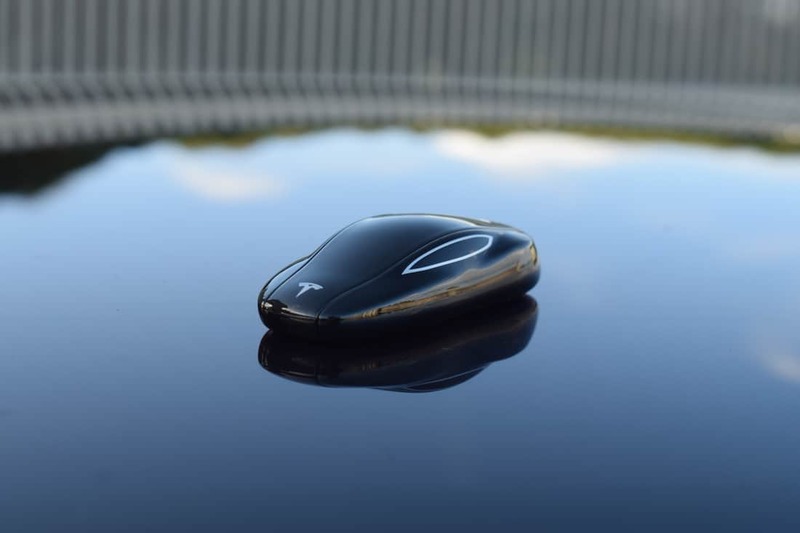 Over-the-air software updates add functionality, enhance performance and improve the driving experience of Tesla vehicles. Similarly, to how you receive updates to your smartphone, Tesla owners receive software updates to their car remotely without visiting a service centre. Additionally, access to Tesla’s mobile app, allows owners to monitor charging, put the climate control on or vent the sunroof. 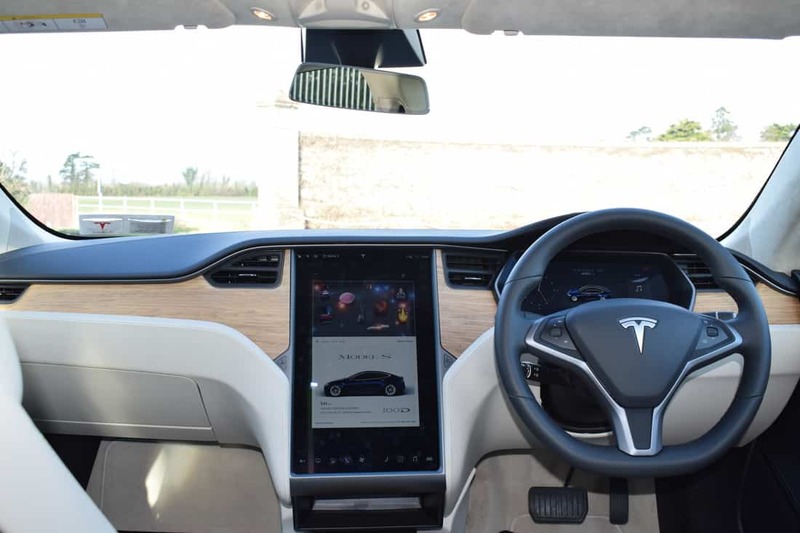 All new Tesla vehicles are fitted as standard with extensive hardware to enable the latest safety and convenience features. Eight surround cameras provide 360 degrees of visibility around the car at up to 250 metres of range. Twelve ultrasonic sensors complement this vision, allowing for the detection of both hard and soft objects. A forward facing radar provides additional data about the world and is able to see through heavy rain, fog, dust and even the car ahead. 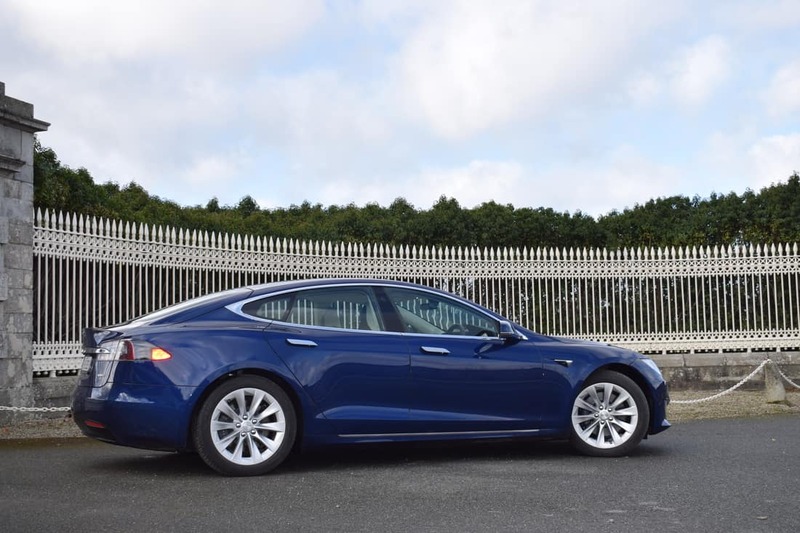 This hardware allows Tesla to provide both active and passive safety features as standard including forward collision warning, AEB, speed and lane assist. 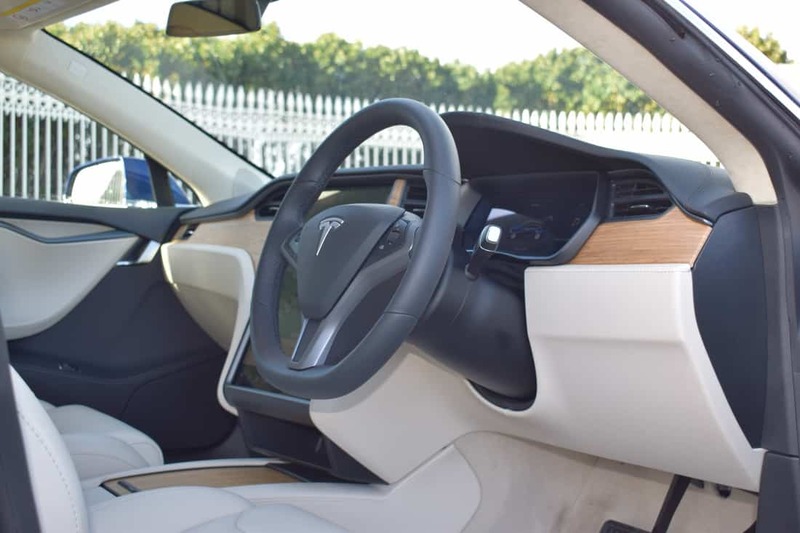 Convenience features can be added through Tesla’s Enhanced Autopilot package, which provides the latest in Level 2 driver assistance with Traffic Aware Cruise Control, Autosteer, Auto Lane Change and Summon. 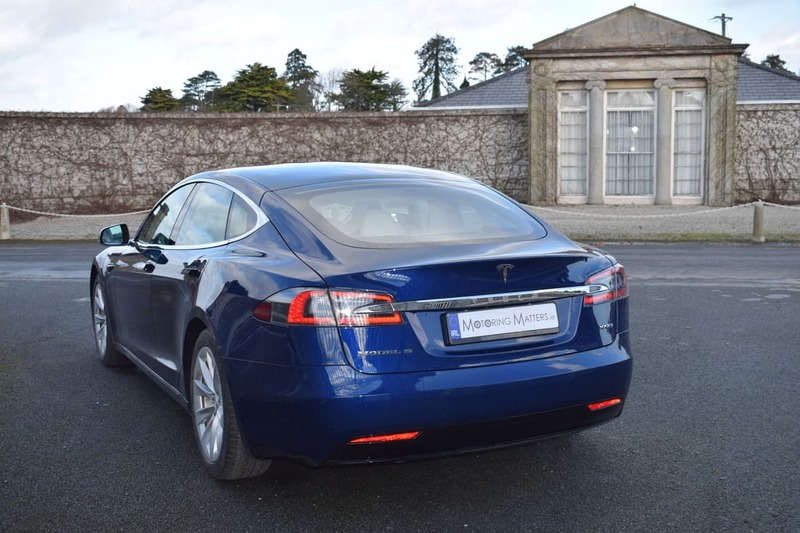 Two versions of the Tesla ‘Model S’ are available in Ireland – the ‘100D’ and the, high-performance ‘P100D’. Both versions are four-wheel-drive and you can choose from two power outputs, with the range-topping ‘P100D’ model featuring a ‘Ludicrous Plus’ mode that will allow it to blast from 0-100 km/h in just 2.7sec. 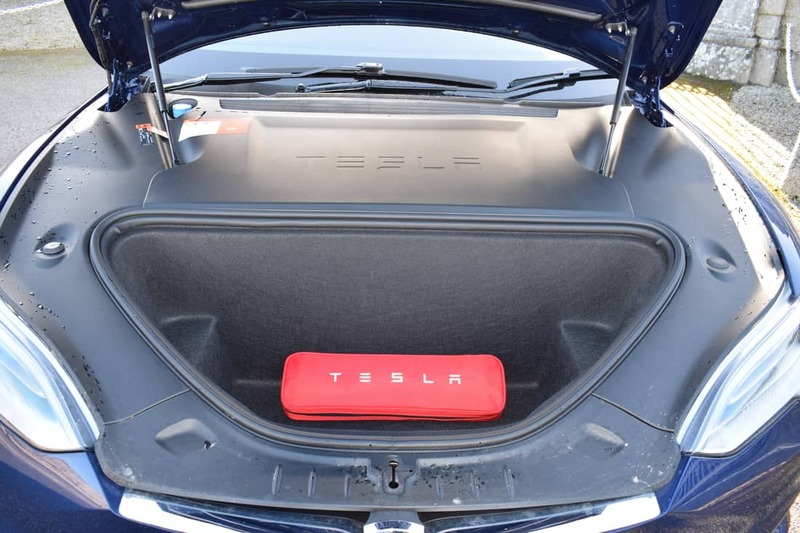 Tesla’s industry-leading driving range is a result of the cars huge batteries, which need 30 hours to charge from flat via a domestic three-pin socket. However, get a proper charging socket installed at home, or use one of the many roadside-charging points, and that time drops dramatically. And if you use one of Tesla’s Superchargers, located everywhere from shopping centres to service stations, you can get an 80% recharge in just 30 minutes. The ‘100D’ has an official range of 632 km (NEDC) and the ‘P100D’s range is quoted as 613km. The ‘Model S’ is incredibly quiet, whether it is in motion, or not, and it remains vibration free when pulling away. There is smooth acceleration, due to the fact that EV’s (Electric Vehicles) deliver their maximum torque from zero revs-per-minute, and there is no need for multiple gears. The ‘Model S’ is quieter and smoother than its rivals, and with all that torque available right from the off, the response and rate of acceleration from a standing start is sensational. 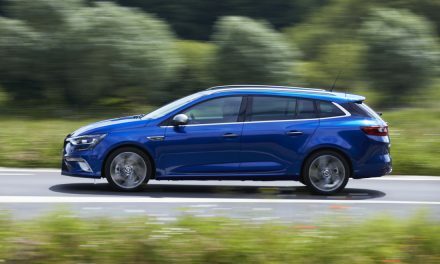 Slowing down does take a little more getting used to, because the strong regenerative braking that helps charge the batteries causes the ‘Model S’ to decelerate quickly as soon as you lift your foot off the accelerator. The brakes themselves are strong and totally reassuring in all circumstances. Five tall adults will be able to get comfortable easily in the ‘Model S’, thanks to its generous leg, head and elbowroom. 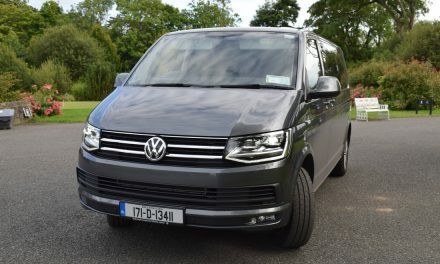 The floor is completely flat, with no central hump running down the middle, making it easy to get in and out of the back and gifting plenty of foot space to the rear middle-seat passenger. 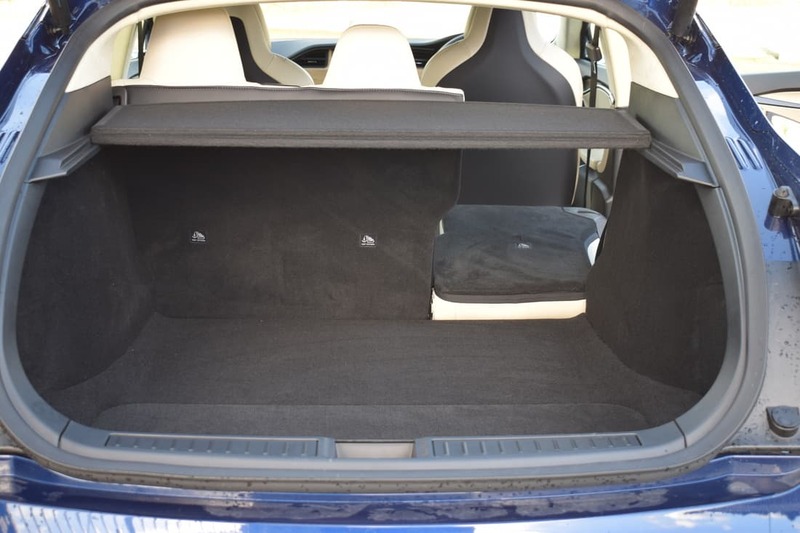 The fact that the batteries are under the floor and the electric motors are so much smaller than a petrol or diesel engine mean you get extra storage beneath the front bonnet, complementing a huge boot. 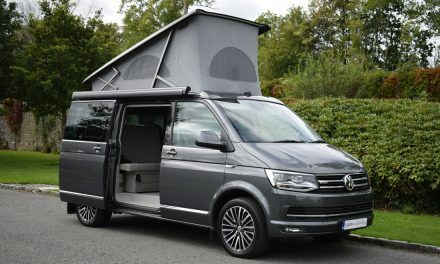 The boot is accessed via a wide opening with a massive 894 litres of space available, and has a powered hatchback tailgate. There is even a large well under the boot floor for additional storage. 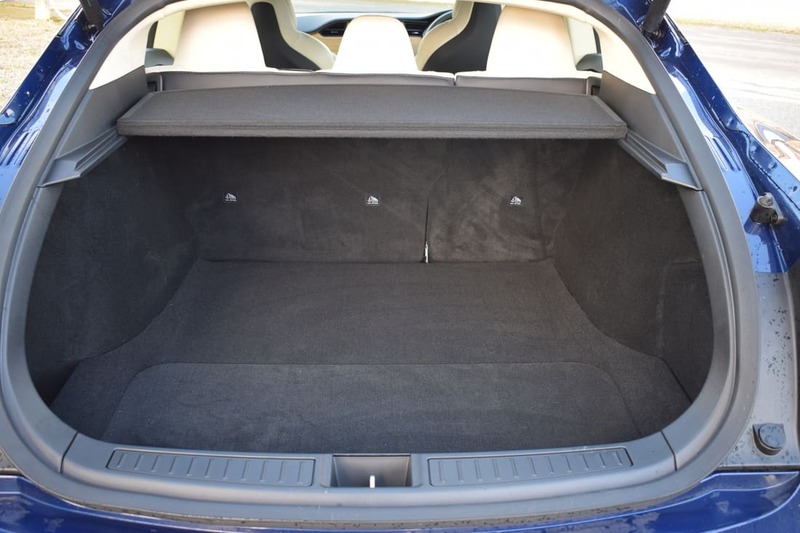 If you need more luggage space, the rear seat has a 60/40 spilt-folding arrangement. 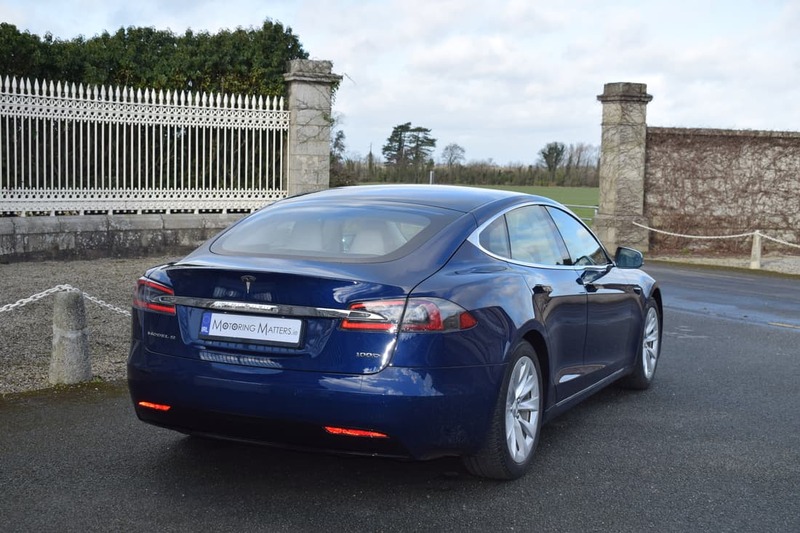 My test car was a Tesla ‘Model S 100D’, finished in Deep Blue metallic paint which, combined with contrasting chrome embellishments, endowed the car with breath-taking good looks. With a beautiful cream interior, the inside of the test car mirrored the stunning looks of the exterior. Plush leather seats provide an appealing and comfortable way to travel. On standard air suspension, the ride is impressive. It’s equally adept on motorways, too, making it a fine long-distance cruiser. When on a motorway, you can make use of Tesla’s Enhanced Autopilot system (an optional extra, but fitted to my test car). This not only maintains a pre-set speed and keeps the ‘Model S’ a safe distance from the car in front, but takes care of the steering as well – even changing lanes when asked if it spots a safe gap in the traffic. Your hands must always be kept on the steering wheel and full attention on the road at all times as Enhanced Autopilot can hand back control quite suddenly if the need arises. It is my opinion that the ‘Model S’ is THE best semi-autonomous driving system currently on the market. 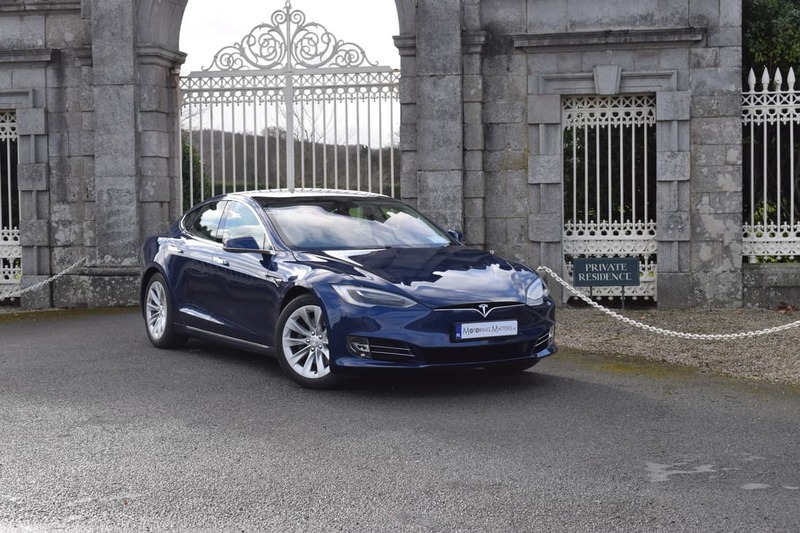 I charged my test car at a ‘Destination Charger’ located in the car park of the K Club Hotel in Straffan, Co. Kildare, and it was super-easy to connect to, and disconnect from. Standard ‘Model S’ equipment includes power-folding door mirrors, electrically operated front seats, dual-zone climate control, leather upholstery, a reversing camera, 12-way power and heated front seats, lighted door handles, LED interior ambient lighting, LED fog lights, parking sensors front & rear, and keyless entry. Plus, there’s internet connectivity with access to Google Maps and internet radio. 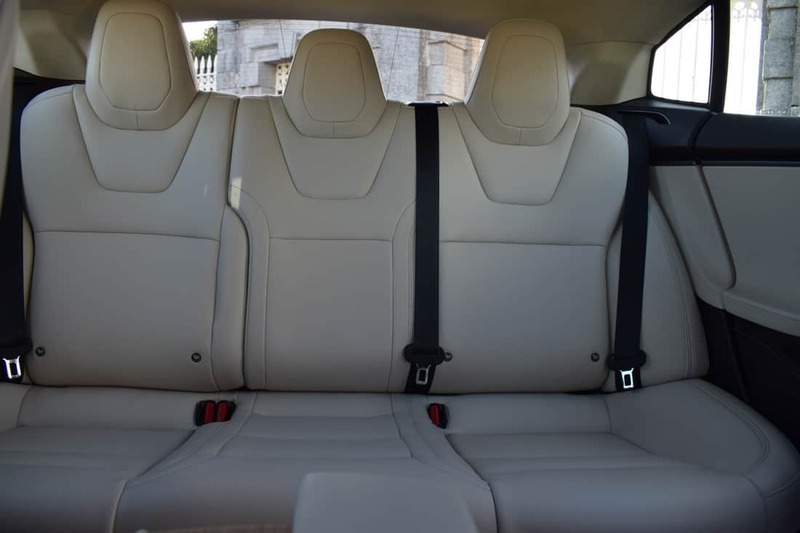 Meanwhile, the impressive list of safety kit includes six airbags, automatic emergency braking and blind spot & lane departure warnings – all of which helped the Model S achieve the maximum five-star rating from Euro NCAP. Inside the car, a giant 17-inch touchscreen dominates the dashboard, along with a digital driver’s display and various other integrated cutting edge technology. The touchscreen is hugely impressive and packed with functionality, making it easy to stream music, get destinations via Google maps and to access driving features such as Autopilot. The cabin is spacious and comfortable and now comes with a new panoramic roof, which lets more light in. Finding a comfortable driving position in the ‘Model S’ is easy, with plenty of adjustment via the electrically adjustable seat and steering wheel. The pedals are well set and the seats are very supportive, while the overall cabin of the car is a very pleasant place to spend time in. 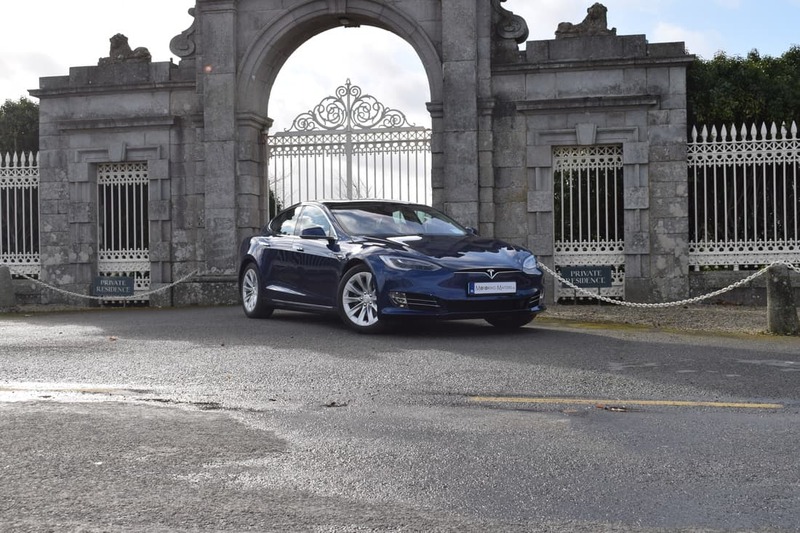 On the technical side, the Model S 100D’s 100kW battery (hence the ‘100D’ name) powers two electric motors, one at each end of the car, giving the 100D the distinct advantage of all-wheel drive. 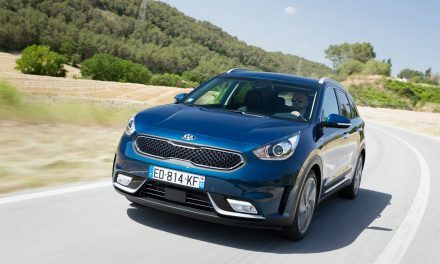 The instant torque from the motors gives the 100D incredible responses. 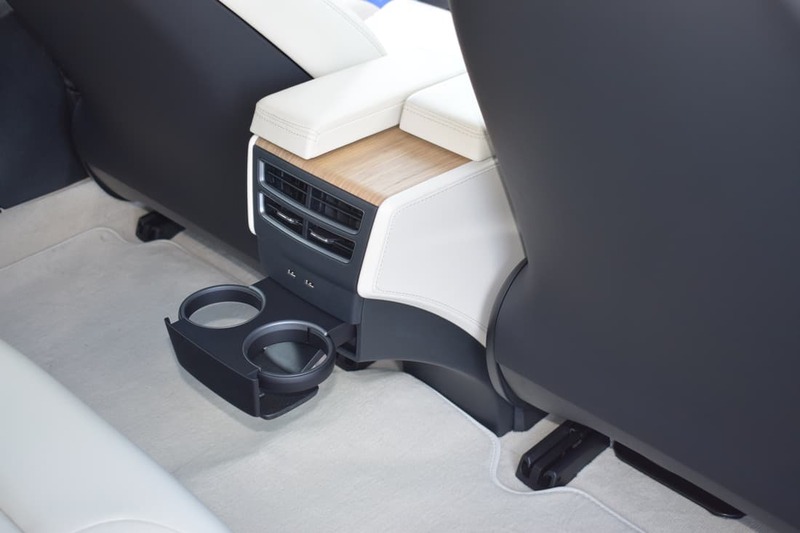 The adjustable air suspension is quite a useful addition too, enabling you to smooth out the worst of the bumps or lower the whole car for more responsive handling. You can do the same to the steering with relaxed or responsive modes. The Tesla Model S 100D is priced from €114,800, or a PCP monthly starting payment of EUR 1,025 per month (after fuel savings). 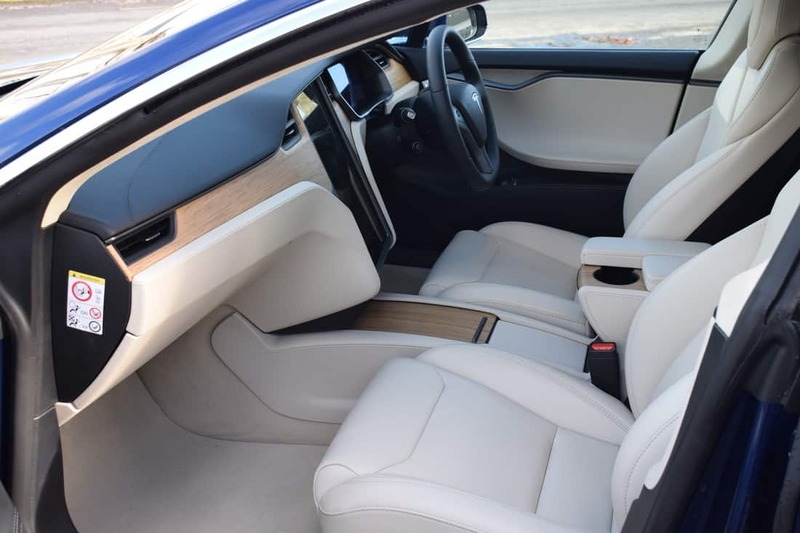 This includes the Premium Upgrades Package, which comes as standard on all Model S cars and consists of the premium interior package, a medical-grade HEPA air filter, upgraded audio system, and heated rear seats, steering wheel & windshield wipers. When comparing the price of any electric vehicle to an internal combustion vehicle, it’s important to compare not just the out-of-pocket price, but also the effective cost of ownership. 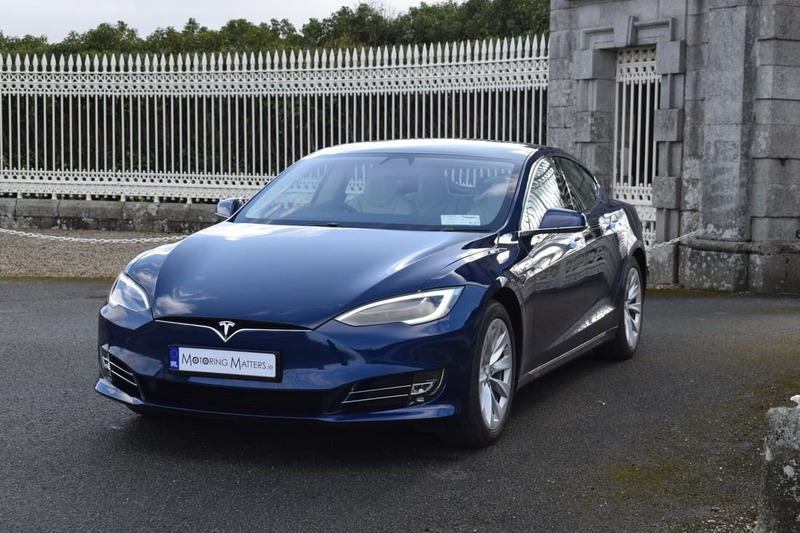 Factoring in typical fuel savings as well as available tax incentives, the effective cost of owning a Model S 100D is a significantly compelling option. Tesla vehicles don’t require regular maintenance like oil changes, fuel filter, spark plug replacements and the likes, while Tesla’s four-year/80,000km bumper-to-bumper warranty, and eight-year/unlimited mileage battery and drive unit warranty come standard with the Model S. Tesla’s over-the-air wi-fi software updates fix glitches and add features while you are asleep, rather than requiring you to book your car into a dealer. Having spent a glorious week living with the truly outstanding Tesla Model S 100D, I can safely say that I am now utterly convinced that the future of motoring is exciting, enticing, and totally electric. With over 100,000 new Tesla’s finding homes (World Wide) in 2018, it seems the electric revolution is in full swing. Visit www.tesla.com or contact the Tesla Store in Sandyford, Dublin 18 for further information. PreviousNew ‘DS7 CROSSBACK’ Luxury SUV – Irish Specifications & Pricing Announced. NextSeven Per-Cent of irish driver’s unaware of tyre penalty point regulations.